Day 4: Arrival in Poland! Day four of our trip included many new things, most importantly our journey to a new country! 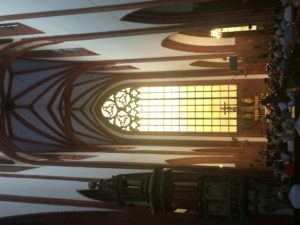 An early breakfast prepared us for the five hour drive from Berlin to Wrocław, Poland. On the way, much of the scenery was very similar to that of Berlin suburbs with very flat land and cute clusters of houses. Our first activity in Poland was a rest stop at a gas station. Although there are a ton of gas stations in America so it is not a drastic culture shock, it was so fun to walk up and down the aisles and see the differences in the food and products. Many people also exchanged their US dollars for Polish Złoty. 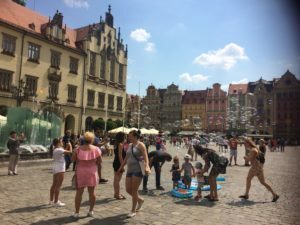 Once we got to Wrocław, we were able to explore the Old Town city-center which included restaurants, souvenir shops and many other stores. 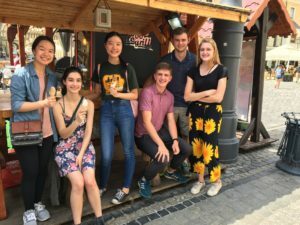 After getting lunch at a 100% vegan restaurant, my group and I explored and some highlights of what we saw were musicians playing in the street, large sandboxes that people were sunbathing in, and a small store selling homemade decorative metalwork. Our final plan for the day was a rehearsal and concert at St. Marie Madeleine Church. 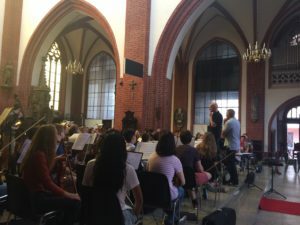 We were all instantly amazed by the high ceilings and beautiful decorations inside, and once we started rehearsing we realized how much the music rings and echos. After our rehearsal, we had a group dinner at a fancier restaurant in the city-center called the Restaurant Spiz. Being able to sit down and enjoy a delicious meal (including mushroom soup, potatoes, chicken and pie) was so relaxing after a long day of traveling and walking. Finally, we had our first concert of the tour. The audience was so appreciative of the music and it was incredibly valuable to be able to perform in a new setting for a new group of people. This performance helped me realize how music truly is the universal language because despite the language barrier, we were still able to share our music with the audience. I think they were very appreciative of our program in that we played some newer American music in addition to Dvorak’s 8th Symphony, because he is highly relevant in both America and Eastern Europe. Tomorrow will be a very similar day to today with some free time for exploring and a concert after our bus ride to Kraków. I have loved our trip so far and look forward to visiting our next cities!